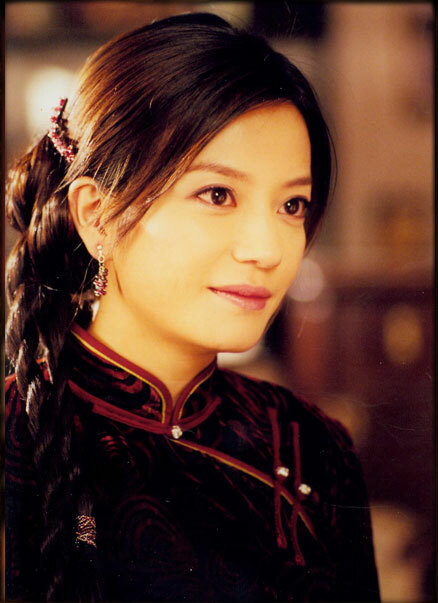 Zhao Wei as Yao Mulan in the 2005 TV adaptation. Moment In Peking is a novel written by Lin Yutang, and published in 1939. Because it was aimed at the Western readership, it was written directly in English, but it was later translated in Chinese under the title 京华烟云. It has been adapted into TV series in China on two occasions; the more recent one features Zhao Wei as the main character. The story follows the life of an extended upper-class Beijing family from the time of the Boxer uprising in 1900 to the beginning of the Second Sino-Japanese War in 1937. It is both a depiction of the daily life of a Chinese family, and a chronicle of the political and social changes sweeping China during that period. The main character is Yao Mulan, who is introduced as a little girl, and becomes a middle-aged woman by the end of the novel. Anachronism Stew: In the Live-Action Adaptation, male characters wear modern hairstyles even before the fall of the Qing Dynasty, a time when men were required to wear their hair in the customary pigtail on pain of summary execution. Armies Are Evil: The good characters repeatedly find themselves on the receiving end of military violence: from the corrupt warlords in the 1920s, and from the invading Japanese in the 1930s. Arranged Marriage: Nearly every marriage that takes place in the story is arranged by the respective spouses' families. Truth in Television insofar as it was indeed the norm in Chinese society at the time. Bittersweet Ending: The novel ends as the surviving characters join the exodus of refugees fleeing the advancing Japanese invaders. Yet, the author chooses not to present this as a Downer Ending, since the war was still being fought as he wrote the book. But Now I Must Go: Mulan's father leaves his family to become a Taoist hermit. He doesn't come back until years later. Les Collaborateurs: Niu Huayu joins the invading Japanese. Also, Suyun before her aforementioned HeelFace Turn. Eccentric Mentor: Mulan's father is a somewhat eccentric practioner of Taoism, and encourages his daughter's intellectual curiosity. The Glorious War of Sisterly Rivalry: Mulan and Mochou. HeelFace Turn: Niu Suyun sides with the Japanese out of self-interest, but eventually changes sides. I Want My Beloved To Behappy: Mulan's attitude towards Kong Lifu, her true love, who instead marries her sister. Meaningful Name: The main character is named after the Mulan, to emphasize her personal bravery and independent spirit. Multigenerational Household: In a traditional Beijing siheyuan (四合院 = courtyard house). Ojou: Mulan is the embodiment of noblesse oblige, a genuinely kind and considerate upper-class girl (and later lady). Taking You with Me: In the 2005 TV adaptation, Mulan's father lures a squad of Japanese soldiers and a pro-Japanese collaborator in his cellar, and sets it on fire with everyone, including himself, locked inside. Upper-Class Twit: Zeng Sunya, Mulan's husband. He does improve as he matures.